2 maps: Ethnic Groups involved in the Maji Maji Rebellion, Place Names in Connection with Maji Maji. Appendices: A. Matumbi Calendar and Activities, B. An Example of Executions in Southwest Matumbiland, C. Recording and Preservation of Texts in the Field. Bibliography. Supplementary Bibliography up to 2005. The manuscript of this book had been lying in the National Archive in Dar es Salaam for more than 30 years, until the Archives and Museum Foundation of the United Evangelical Mission (Wuppertal / Germany) decided to publish it and consequently to make it open to a wider public. The occasion for this was the centenarian commemoration of the Maji-Maji-War in Tanzania, in former times German East Africa (Deutsch-Ostafrika). The author Gilbert Klement Kamana Gwassa already presented this work as his dissertation in 1973 to the University of Dar es Salaam. What makes it so particular is the fact that it is one of the first studies in Africa about a colonial war from the point of view of an affected. At the end of the 1960s the author was able to question some contemporary witnesses who had experienced the war as youths or concerned family members. Additional, a lot of documents had been at his disposal, amongst others from the German colonial Archive in Potsdam (Deutsches Kolonialarchiv Potsdam). He evaluated written and oral sources, and also factored the precolonial history of the southern areas of Tanzania during the 18th and 19th century to display that this region had already had peoples comprehensive experiences with violance and foreign rule through slave manhunts and leaderships of the sultanes on Zanzibar. 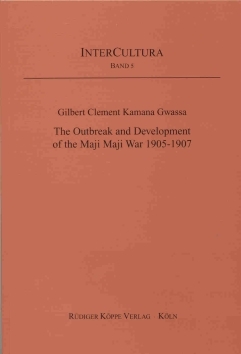 These historical experiences are at least to some extent an explanation for the fast diffusion of the Maji-Maji ideology in the South of the country from 1905 on. The author had repeatedly visited the scenes of events and studied the inhabitants’ cultures on the spot. The result is a realtime and realistic picture of the incidents between 1905 and 1907 originated in the area of conflict between the indigenous and the colonial perspective. And even 30 years later – after the premature death of the author – the work did not loose its topicality. The editors arranged the present book in a way which makes it possible everytime to refer to the original manuscript version. The scholarly literature published after 1963 as well as the literature which the author did not consider is found in an extra bibliography at the end of the book. Finally, bearing in mind readers who are familiar with the places two maps of the mentioned places and peoples are also appended. Following this link you will find a review of the edition by our author Jigal Beez in “Habari Infobrief des Tanzania Network“ (4/2008). Wenn eine Dissertation 32 Jahre auf ihre Veröffentlichung warten muss, dann liegen außergewöhnliche Umstände vor. [...] Seine Ergebnisse veröffentlichte Gwassa in einigen Sammelbandbeiträgen und einem Heft der recht populären Papiere der "Historical Association of Tanzania". Seine Dissertation aus dem Jahr 1973 wurde aber nie publiziert. Es schaffte auch kein Exemplar dieser Arbeit den Eingang in europäische oder amerikanische Bibliotheken, so dass man diese Schrift nur in Dar es Salaam an der Universitätsbibliothek einsehen konnte. Nur wenige bekamen dazu die Möglichkeit, so dass in der Maji-Maji-Forschung Gwassas Dissertation so etwas wie ein Mysterium wurde, oftmals zitiert, aber nur selten gelesen. [...] Der Köppe Verlag hat dem mit Schreibmaschine getippten Original ein zeitgemäßes Layout verpasst. Sehr benutzerfreundlich ist, dass dabei die ursprünglichen Seitenzahlen in eckigen Klammern angegeben werden. So kann man leicht Zitate wiederfinden, die sich auf die Originalausgabe beziehen. Am Ende des Bandes findet sich eine ergänzende Bibliographie, die Werke der Maji-Maji-Forschung bis zum Jahr 2005 umfasst. In einigen Punkten sind Historiker und Ethnologen mittlerweile zu anderen Ansichten als Gwassa gelangt. [...] Trotzdem hat Gwassa mit seiner Dissertation der Forschung über den Maji-Maji-Krieg wichtige Impulse gegeben. So war er der Erste, der dafür plädierte, das Ereignis nicht mit der Terminologie der Kolonialherren als „Aufstand“ oder „Rebellion“ zu bezeichnen, sondern als „Krieg“, was sich inzwischen in der Forschung weitgehend durchgesetzt hat. Doch nicht nur deshalb lohnt die Lektüre des Buches. Lesenswert sind auch die Erinnerungen der rund 80 afrikanischen Zeitzeugen, die Gwassa für seine Dissertation gesammelt hat und die er häufig zu Wort kommen läßt. Viele der mündlichen Quellen waren bisher weitgehend unbekannt, da Gwassa nur einen Bruchteil des von ihm gesammelten Materials für seine Aufsätze benutzte. Sie machen die Motive der Widerstandskämpfer deutlich und lassen erahnen, welche Grausamkeiten und Härten die afrikanische Bevölkerung während des Krieges erdulden mußten [sic! ].